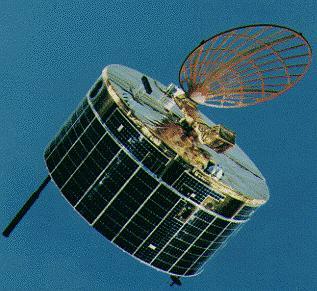 Japanese technology satellite. Series of spacecraft of varying configurations built for engineering tests of scientific satellite equipment. Status: Operational 1971. First Launch: 1971-02-16. Last Launch: 1985-01-07. Number: 5 . Sakigake ('Pioneer') is a test spacecraft similar to Suisei (Planet-A). It flew by Comet P/Halley on its sunward side at a distance of about 7 million kilometers on March 11, 1986. It carried three instruments to measure plasma wave spectra, solar wind ions, and interplanetary magnetic fields, all of which worked normally. The spacecraft was spin-stabilized at two different rates (5 and 0.2 rpm). It was equipped with hydrazine thrusters for attitude and velocity control, star and sun sensors for attitude determination, and a mechanically despun off-set parabolic dish for long-range communication. Sakigake made an Earth swingby on January 8, 1992. The closest approach was at 23h08m47s (JST, = UTC+9h) with a geocentric distance of 88,997 km. This was the first planet-swingby for a Japanese spacecraft. During the approach, Sakigake observed the geotail. A geotail passage occurred at 290 Re on 14 June 1993 before ISTP's multi-spacecraft investigation of that region. The second Earth swingby was on June 14, 1993 at 40 Re, and the third on October 28, 1994 at 86 Re. Almost no hydrazine remains so no further maneuvers were accomplished. 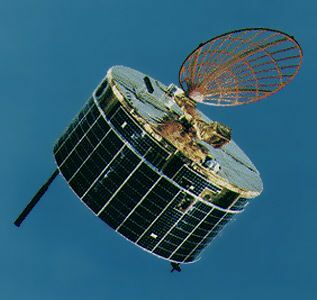 Telemetry contact was lost on 15 November 1995 at a distance of 106 million km. Future mission planning had included a 23.6 km/s, 10,000 km flyby of Comet P/Honda-Mrkos-Pajdusakova on Feb 3, 1996 (approaching the nucleus along the tail) some 0.17 AU from the Sun, and a 14 million km passage of Comet P/Giacobini-Zinner on Nov 29, 1998. Family: Technology, Technology satellite. Country: Japan. Launch Vehicles: Mu, Mu-4S, Mu-3C, Mu-3H, Mu-3S, Mu-3S-II, Mu-3. Launch Sites: Kagoshima, Kagoshima M. Agency: ISAS. Bibliography: 2, 296, 6, 13257, 13258, 13259, 13260, 13261. 1971 February 16 - . 04:00 GMT - . Launch Site: Kagoshima. Launch Complex: Kagoshima M. LV Family: Mu. Launch Vehicle: Mu-4S. Tansei 1 - . Payload: MS T1. Mass: 62 kg (136 lb). Nation: Japan. Agency: ISAS. Class: Technology. Type: Navigation technology satellite. Spacecraft: Tansei. USAF Sat Cat: 4952 . COSPAR: 1971-011A. Apogee: 1,106 km (687 mi). Perigee: 986 km (612 mi). Inclination: 29.70 deg. Period: 106.10 min. Engineering test for the launching of scientific satellites. Injection point 29.7 N, 145.8 E .
1974 February 16 - . 05:00 GMT - . Launch Site: Kagoshima. Launch Complex: Kagoshima M. LV Family: Mu. Launch Vehicle: Mu-3C. Tansei 2 - . Payload: MS T2. Mass: 65 kg (143 lb). Nation: Japan. Agency: ISAS. Class: Technology. Type: Navigation technology satellite. Spacecraft: Tansei. Decay Date: 1983-01-22 . USAF Sat Cat: 7122 . COSPAR: 1974-008A. Apogee: 3,231 km (2,007 mi). Perigee: 284 km (176 mi). Inclination: 31.20 deg. Period: 121.70 min. Attitude control satellite (performance test of launch vehicle). .
1977 February 19 - . 05:15 GMT - . Launch Site: Kagoshima. Launch Complex: Kagoshima M. LV Family: Mu. Launch Vehicle: Mu-3H. Tansei 3 - . Payload: MS T3. Mass: 230 kg (500 lb). Nation: Japan. Agency: ISAS. Class: Technology. Type: Navigation technology satellite. Spacecraft: Tansei. USAF Sat Cat: 9841 . COSPAR: 1977-012A. Apogee: 3,802 km (2,362 mi). Perigee: 799 km (496 mi). Inclination: 65.80 deg. Period: 134.10 min. Tentative name before launching: MS-T3. Launching organization: Institute of Space and Aeronautical Science, University of Tokyo. Radio frequencies: 136.725 MHz, tracking; 400.500 MHz, telemetry. Active life: two weeks. Function: (1) Test of the overall p erformance of the newly developed launch vehicle, M-3H-1. (2) Experiment of magnetic stabilization. (3) Observation of ultraviolet radiation. 1980 February 17 - . 00:40 GMT - . Launch Site: Kagoshima. Launch Complex: Kagoshima M. LV Family: Mu. Launch Vehicle: Mu-3S. Tansei 4 - . Payload: MS T4. Mass: 134 kg (295 lb). Nation: Japan. Agency: ISAS. Class: Technology. Type: Navigation technology satellite. Spacecraft: Tansei. Decay Date: 1983-05-12 . USAF Sat Cat: 11706 . COSPAR: 1980-015A. Apogee: 608 km (377 mi). Perigee: 517 km (321 mi). Inclination: 38.70 deg. Period: 95.90 min. 1985 January 7 - . 19:26 GMT - . Launch Site: Kagoshima. Launch Complex: Kagoshima M. Launch Pad: M1. LV Family: Mu. Launch Vehicle: Mu-3S-II. SS-10 Sagikake - . Payload: MS T5. Mass: 141 kg (310 lb). Nation: Japan. Agency: ISAS. Class: Technology. Type: Navigation technology satellite. Spacecraft: Tansei. USAF Sat Cat: 15464 . 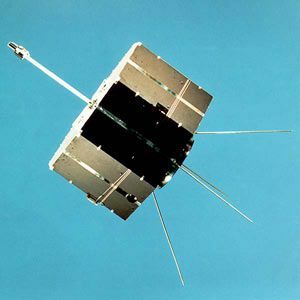 COSPAR: 1985-001A. 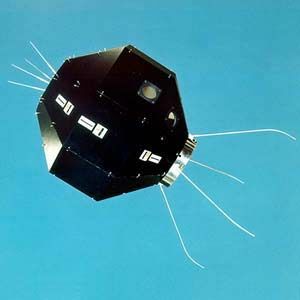 Sakigake ('Pioneer') was a test spacecraft similar to Suisei (Planet-A). Objectives were :verification of fundamental technology related to interplanetary missions, including deep-space communication, attitude control, attitude determination; study and observation of solar wind and plasma waves and interplanetary magnetic field. It carried three instruments to measure plasma wave spectra, solar wind ions, and interplanetary magnetic fields. 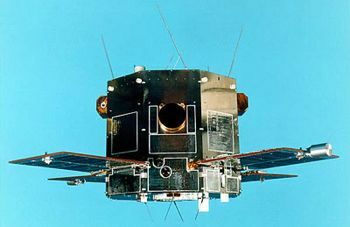 The spacecraft was spin-stabilized at two different rates (5 and 0.2 rpm). It was equipped with hydrazine thrusters for attitude and velocity control, star and sun sensors for attitude determination, and a mechanically despun off-set parabolic dish for long-range communication. Launched into an initial heliocentric orbit with a period of 318.8 days, at 151.4 x 121.9 million km (0.815 x 1.012 AU), 1.439 degree inclination. Flew by Comet Halley on its sunward side at a distance of about 7 million kilometers on March 11, 1986. It later made an Earth swingby on January 8, 1992 with a closest approach of 88,997 km. This was the first planet-swingby for a Japanese spacecraft. During the approach, Sakigake observed the geotail, with passage occurring at 290 Re on 14 June 1993 before ISTP's multi-spacecraft investigation of that region. The second Earth swingby was on June 14, 1993 at 40 Re, and the third on October 28, 1994 at 86 Re. Almost no hydrazine remained so no further maneuvers were accomplished. 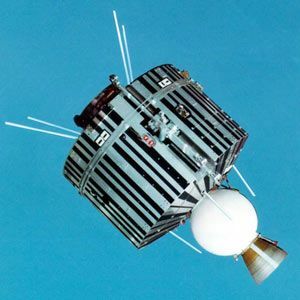 Telemetry contact was lost on 15 November 1995 at a distance of 106 million km. Future mission planning had included a 23.6 km/s, 10,000 km flyby of Comet Honda-Mrkos-Pajdusakova on Feb 3, 1996 (approaching the nucleus along the tail) some 0.17 AU from the Sun, and a 14 million km passage of Comet Giacobini-Zinner on Nov 29, 1998.